Second hand bicycles are collected in Vorarlberg (Austria), shipped to South Africa, completely refurbished, “Africanized” and sold as commuter bikes in South Africa. A part of the bikes are made as working medium. If someone can’t afford a bicycle he/she has the option to “build their own“ in return for a fair equivalent in labor to the company. And we will need many hands to properly clean and refurbish all our bikes; some to fancy mountain bikes others to “working horses” that support 100 kg and more. Collect secondhand bikes from European people like you and me, bicycle dealers, cities, etc. Effect: use of valuable materials that otherwise would become waste and reduction of footprint and thus impact on the environment. Low-end bikes are sold at a nominal price in POP bike shops in rural towns while high-end bikes are sold online and delivered directly to the customers. People who can’t afford to buy a bike have the opportunity to earn one by working off the equivalent in hours at the company (job creation rather than free handouts). Why do we sell DAZUD bikes only in South Africa? Please understand that we aim to live and work in a sustainable world, thus all DAZUD products are managed and produced the way we truly believe is best for nature, society and environment. 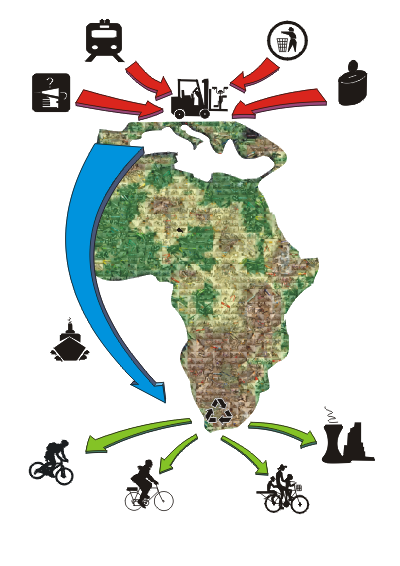 The carbon dioxide footprint would increase significantly if we offered DAZUD bikes are refurbished in South Africa and shipped abroad again.